I went with a dark background fabric for the Nighttime Sky quilt block just to go along with the name. Also, I figured stars were different shades of yellow or gold, hence those colour choices. 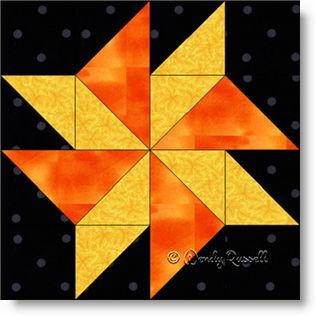 This four patch quilt block would be a good choice to introduce a new quilter to the flying geese patch as it is a common choice in patchwork. Actually, I took a liberty with the construction of this block and figured less seams is always a better choice and so, I used the flying geese patches rather than having an additional seam in that patch from using half square triangles, as was the original design of the block. The sample quilts illustrated are both set with blocks on point, but by adding or subtracting blocks and replacing with plain blocks, you can achieve two very different quilts.